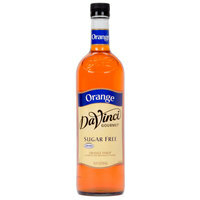 This user-friendly bottle of DaVinci Gourmet sugar free orange flavoring syrup allows your busy baristas to quickly and easily serve up delicious hot, cold, or blended drinks with irresistible flavor without the sugar content! DaVinci Gourmet flavoring syrups complement your beverages without overpowering them or being too sweet. They are specially formulated to resist curdling in milk and hold up well under heat, making them the perfect choice for espresso-based drinks, brewed coffee or tea, and more. Such a great Orange flavor. I am sure there are so many uses for this orange flavoring syrup but I really like it in sparkling soda. Nice, classic sugar free flavoring. It is not overly sweet like some sugar free syrups tend to be. It pairs nicely with the sugar free chocolate. It tastes like orange and has a nice orange smell to it. I can't even imagine orange coffee. Those who liked this one enjoyed it mostly in hot cocoas. I personally dislike splenda. This flavor is quite realistic and strong - reminds me of my favorite diet orange sodas. It actually mixes in well with all kinds of other flavors - mix it with cream soda for an orange creamsicle. Mix it with cranberry or raspberry soda for a great fresh fruit mix. Definitely buying this one again!